Italy has passed a decree banning the use of illegally tapped telephone conversations in the media and as evidence in court. The moves come after an investigation into a murky bugging ring reportedly targeting high-profile figures. Leaked phone taps sparked a series of scandals in Italy, including one that rocked the country's football league. 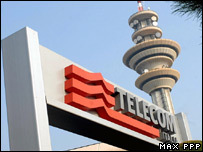 The former security chief at Telecom Italia was recently arrested as part of the investigation. Piero Fassino, leader of the largest party in Romano Prodi's centre-left governing coalition, said of the phone spying ring: "They wanted to blackmail the country." The new legislation makes it illegal to possess or publish the contents of unauthorised phone taps. Newspapers face a fine of 50 euro cents (33p) for every single copy published containing such information. The fine can rise to as much as one million euros (£672,700) for major broadcasters and publishers. "The moral duty was to guarantee that the sacredness of democratic life is not in doubt," Justice Minister Clemente Mastella said. Italy's interior minister said the law would not have any impact on freedom of expression and was not aimed at journalists, but rather the senior management of media organisations. Some 21 people have been arrested as part of the investigation, including the current head of security at Telecom Italia's parent company, Pirelli.